"This is the perfect blend! It's sweet, refreshing, and soothing." Have Hope was created to relieve worry and angst with St. John's Wort, holy basil, and oatstraw in a blend of peppermint leaves, roasted chicory root, and sweet white chocolate curls. Ingredients: Organic Peppermint, Organic Spearmint, Organic Rooibos, Organic Chicory Root, Organic White Chocolate Curls, Organic Holy Basil, Organic St. John's Wort, Organic Oatstraw, Organic Rose Petals, Natural Flavors. Uplifting St. John's Wort, calming holy basil, and nourishing oatstraw were used in this blend to relieve anxiety and restore optimism. St. John's Wort helps to improve mood and lift spirits. Holy basil, an adaptogen herb from India helps restore emotional balance and calm frayed nerves. Oatstraw contains B vitamins and minerals that help restore calm and fight stress. 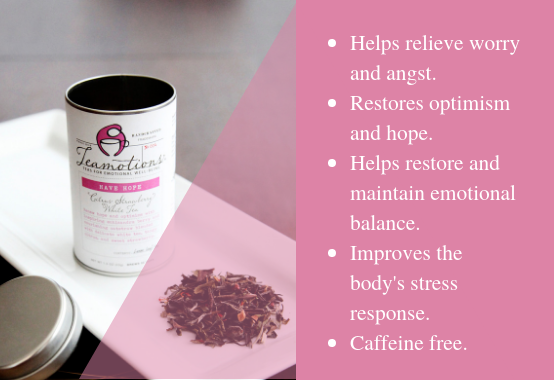 Used together in this blend, Have Hope can help calm your nerves, relieve worry, and restore optimism. The Perfect Cup: Pour 8oz of 180 degree filtered water over 1 rounded teaspoon of loose tea and steep for 3-4 minutes. Take in the uplifting aroma while you wait, then strain and enjoy. Resteep for a delicious second cup. Our Little Tip: As you sip, put on some beautiful music or song that inspires you. Let the music and the tea lift your spirits. Try it today and see what Have Hope can do for you. What are people saying about Have Hope?